To a background of heavy bass from the Download Festival, six boats drifted around an excellent course set by Bob Ceurstemont. Gold winner was Mike Pritchard from Roger Day and Kevin Milton with Louis Mok winning the bronze fleet from Nick Colbeck. Silver fleet sailors seem to prefer stronger winds. 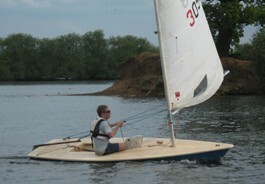 The second race was not held due to the wind having dropped completely. After six races the GSB fleets are taking shape. In the gold fleet Mike Pritchard leads and at present he and Bob Cuerstemont are battling for overall winner and looks like either Roger Day or Kevin Milton will be third. The relegation positions are held by Kevin Last, Malcolm Davidson and Jill Reid with Jill seemingly certain to be relegated this season. Another three competitors are in danger of falling in to the relegation zone. The silver fleet is led by Nick Marlow from Paul Jago with Josie Adams, Nick Turnbull-Ross and Rob Corner battling for the other promotion place with the other five battling to stave off relegation. Roger Chilvers leads the bronze fleet from Brendan McGrath and Nick Colbeck with Mike Leach, Louis Mok and Nick Whiles also in with a chance of promotion but need to get a few more races in.